After yesterday’s comeback win to even the series against the Diamondbacks, the Dodgers entered today victorious in six of their last seven and with a chance to pull even in the NL West race. A couple of long balls seemed like enough to get by a terrible offensive showing by the Dodgers, but late heroics from Matt Kemp led to yet another comeback in a 3-2 victory. The Dodgers had to like their chances with the red-hot Clayton Kershaw on the mound, who seems to have adjusted yet again to excel with the new normal of his velocity. Today he limited the Diamondbacks to four hits and no walks in seven innings, but unfortunately two of those hits were solo homers from Eduardo Escobar in the 2nd and Christian Walker in the 6th. He only struck out three, as the stuff wasn’t as sharp as it had been, but he did break off this slider. The lack of swings and misses left things up to the defense, and they generally came through, like with these stellar plays by Brian Dozier and Manny Machado. For the offense, it was the same old story early on. They put runners on first and second with two outs in the 2nd, but Kershaw stranded them. They put a runner on second with one out in the 3rd, but Machado and Kemp stranded him. 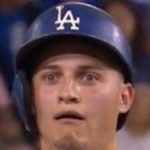 They even put runners on second and third with one out, but Austin Barnes and Kershaw stranded them. Worse yet, they then went down in order in the next three innings. Thankfully, the 8th inning happened. With one down, Justin Turner started it with a single and Machado had a key plate appearance in drawing a 10-pitch walk. 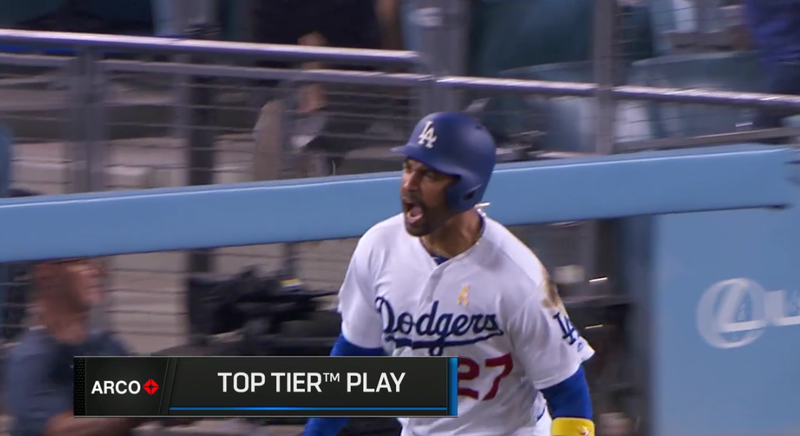 The struggling Kemp followed and he quickly got behind, but eventually capitalized on a hanging curve for a go-ahead, three-run dong, his 19th of the year. Of course, that still left two innings for the revamped pen to get. Kenta Maeda got an inning, looking as sharp with a 1-2-3 frame consisting of two strikeouts. Kenley Jansen once again entered in the 9th, coming off seemingly regaining whatever he lost while on the DL in his last outing. Today he got help from the defense, as Enrique Hernandez made this stellar sprawling play. Kenley got the next one by himself with a strikeout, but he then hung a slider for a double because nothing can ever come easy. Mercifully, he got a can of corn infield pop-up to seal the game. The Dodgers improve to 74-62 overall, and most importantly they pull into a tie in the NL West with the Diamondbacks. Tomorrow, they’ll look to take the lead at 10:10 AM HST/1:10 PM PST/4:10 PM EST, with Walker Buehler facing off against Clay Buchholz.